Nature v. Nuture, in parents? It occurred to me recently that the Nature v. Nurture question is not exclusive to children. It can also apply to parenting. My boys are very different. It’s been apparent since early on. Where my oldest has always been quite stoic, my second son has a quick smile for (nearly) everyone. My oldest despised bathtime (and still does, on occasion), but my second acts like he’s at a spa (you may remember the picture post illustrating this). My oldest has always had a big independent streak, and my second craves more attention. The biggest difference that I’ve noticed so far, though, has been in eating habits. My oldest has never been a big eater, and my second, well, let’s just say he’s never refused a meal. I just stop feeding him when I think he must be done, because I still can’t tell when he wants to stop. His little mouth keeps opening. And then he can eat or nurse or whatever, like, two hours after a major meal. It’s phenomenal. Son #1 eating. Note the expression on his face. It is not one of pleasure. With my oldest, though, it was a struggle. It didn’t help that whenever I found a food that he seemed to really like, I would stock up, only to be rebuffed as soon as I had a ridiculous amount of whatever the food was (fruit cups, crackers, waffles, you name it, I’ve bought it). Or, even worse, as soon as the food was made (rice, pasta, etc), he would no longer be interested. Ugh. It was very discouraging. Eventually, I got into a groove and figured out what he mainly likes to eat (carbs, carbs, carbs! ), and he started to eat a little more as well. Now we have a fairly good agreement where he eats somewhat well (for a toddler, that is), and I don’t stress out about making him his food. It got me thinking that it was because my oldest was never a big eater that I found feeding him less than enjoyable. Though at first I was willing to put time and effort into getting food into the little guy, after so many failed meal attempts, I just didn’t have the desire to continue to make specific foods (read: getting more pots and dishes dirty) that he wasn’t going to eat anyways. So it’s not that I didn’t like feeding my child, or whatever, it was just a lot of frustration all the time, so I started to not enjoy it. At some point I stopped worrying so much about feeding him, and just accepted the fact that I was only willing to go so far to get a picky toddler to eat. And that I was okay with that. He was growing fine, albeit on the small side, but the pediatrician was never concerned, so I decided not to be, either. See the happiness? That is a baby who loves to eat! 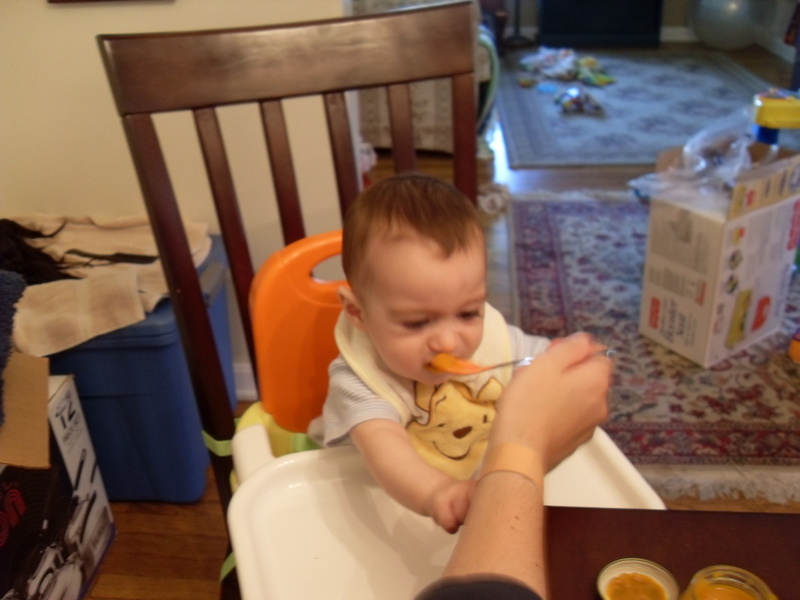 Then came son #2’s foray into solid food, and the kid eats everything. Seriously. Everything. All the time. Constantly. Frankly, after the experience with my oldest, I was nervous about feeding the baby. 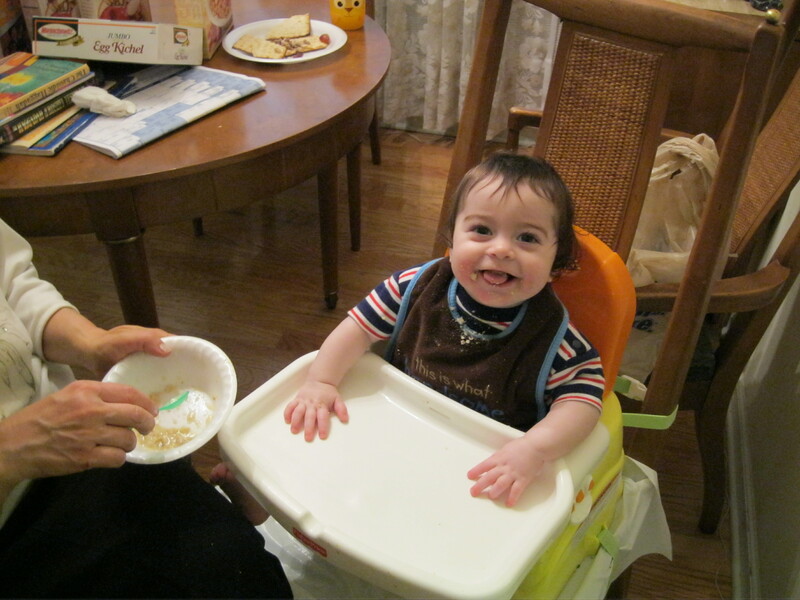 I had seriously negative associations with mealtime, and, as a result, dragged my feet when it came to feeding him. Thankfully, we spent Pesach at my in-laws, and my MIL spent many happy hours feeding him all sorts of things, and when I saw how easy he was it gave me courage to start. And you know what? It’s not so bad. The hardest part is figuring out when to stop feeding him! Now, we still have to see what happens when he gets to toddlerhood, when appetites notoriously taper off, but as of right now, he’s going strong. Also, by the time he’s a toddler, I’ll be more experience and less likely to be so hard on myself (I hope). So it turns out that even mommies are affected by the nature v. nurture question. Who knew? Next Post Around the Web and Picture(s) of the Week: Standing Genes? This post had me chuckling to myself! My oldest son is the same as your oldest – he doesn’t like to eat much except crackers, pretzels, cookies, pizza…carbs, carbs, carbs! The only real food he’d eat was yogurt (or in his language logurt!). Over pesach he probably had two yogurts each day…and he seriously lost weight – I was able to tell without taking him to the doctor! My daughter just started baby jars and would have ate more if I hadn’t stopped her! So it seems like there is a certain nature kids are born with, especially when it comes to mealtimes – and we can’t change all of that! Now my son is starting to get better about the foods and started to be more open to other foods, mainly the foods we’re eating – while we’re eating them!! I’m glad I’m not alone! We also had a really hard time getting my toddler to eat over Pesach. We finally found some Pesach macaroni, B”H!! I’ve also noticed that my toddler is eating more of the foods we’re eating, sometimes, that is. Thanks for commenting. I was beginning to think that this post was a total dud, since no one had said anything! I wonder if those Kosher for Pesach macaroni are any good. I remember trying them one year and they didn’t cook well so never tried them again – but if you got your son to eat them then hey! that’s a score! They really weren’t great at all, but they were close enough to a noodle-like texture that he ate them, so I was thrilled!